At Miami, the words Love and Honor are frequently heard. Some may struggle to connect with what those words mean in regard to their University experience. One family defines what these words mean, and are to be honored this weekend during a chamber music performance at Hall Auditorium. The family of Robert and Marty Hickey have for the last 45 years, established a life long connection to Miami University. Working in university publications and graphic design, this dedicated couple began their association with Miami in 1970 until they retired in 1990. By this time, all six of their children had attended Miami, graduated and moved on, while some returned to obtain masters degrees and eventually to start their teaching careers. Peg Faimon (ne Hickey) is now the chair of the Department of Art. Her brother Joe and his wife Kelley met while studying percussion and viola in the music department. Their three daughters, Monica, Molly and Maureen also became a part of the department of music at Miami, with all studying violin performance. 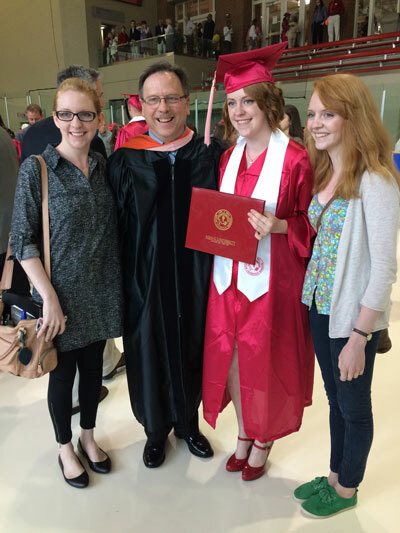 The Hickey family represents what Miami University does best, providing an atmosphere where discovery, possibility, and creativity are encouraged and developed. This family, made up of enormously creative people, continues to give back to this community where their creative impulses were developed. Morpheus Chamber Ensemble, a faculty/student string ensemble will give a free performance this Saturday, November 7 in Hall Auditorium at 5:00 p.m. The concert will feature three Hickey sisters, Monica, Molly and Maureen, as soloists in Brandenburg Concerto No. 3 of J.S. Bach. Also performed by Miami music students and faculty, will be works by Brahms and Grieg. "The annual Morpheus event invites prospective high school students, primarily string players in the regional area, who are interested in learning more about Miami's majors, minors and programs as part of the Department of Music and the College of Creative Arts at Miami," states Harvey Thurmer, associate professor of music at Miami. Thurmer and the string faculty at Miami wanted to take this opportunity to celebrate the Hickey family and to honor the memory of Kelley Hickey, mother of the Hickey sisters, who passed away in March 2014. Kelley had been a tireless advocate of music throughout the area, and was active up until the last few months of her life as a performer and teacher. Their father, Joe, remains active as a percussionist, performing in various orchestras in the tri-state area. "On behalf of the string faculty at Miami, we wish to honor a family who understands what Love and Honor means and also to continue the traditions that this family has so clearly embraced," says Thurmer. Brandenburg Concerto No. 3 in G Major by J.S. Bach; featuring violin soloists Monica, Molly and Maureen Hickey.